Amanda Jean has done it again! Not only does she make the coolest things, but now she has a line of fabric to make all those fabulous things with! Her line of fabric with Connecting Threads is called Good Neighbors and for those of you who have spent any amount of time with Amanda, know that is the perfect name for her fabric. In celebration of her fabric line, the folks at Connecting Threads are throwing a pincushion blog party! Once again, very fitting for Amanda who must have hundreds of pincushions! For my Good Neighbors pincushion, I used the Ann block from The Farmer's Wife 1930's Sampler Quilt book, reduced the block to 3" (!!) and paper pieced it. I always color in my paper piecing patterns so I don't get the fabrics confused! For the back, I crocheted a little 3" single crochet patch to sew onto the block, and stuffed it with wool scraps. Here are the Good Neighbors pincushion party participants for you all to check out! There are lots of great pincushions featuring Good Neighbors (like this one by Krista! and this one by Faith!, and these by Anna!, so inspiring! One last bit of exciting news, Connecting Threads is offering up a charm pack of Good Neighbors to one of you (Canadian or US residents only please!). Leave a comment on this post to enter, and I'll choose a winner in a week. I love the little pincushion, it is adorable! Thanks for a chance to win. Love ur pin cushion. I love this fabric line! I also like paper piecing, but, wow! those pieces are tiny! Thank you for the tutorial on the Ann block, it is great for a pincushion. Sweet pincushion! Love the idea of using crochet along with the lovely fabric. I am starting a farmer's wife 30's QAL so I enjoyed seeing what you did with the block. When I saw your name on the pincushion parade, I squealed and thought, "I bet Penny will do a paper pieced one." I was right! What I didn't expect was the crocheted background and the wool stuffing. 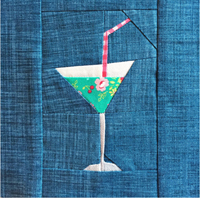 You are one clever quilter. Thanks for sharing your talent and making such a delightful pincushion. very cute pincushion! You're piecing is very impressive! Penny, what a cool crocheted backing for a pin cushion...how natural and original. Love it. So glad you joined this blog hop..it's been thee most fun. thanks for sharing your pinnie. After reading many posts by Amanda Jean and her pin cushions, I'm inspired to make one w/scraps left over from each of my quilting projects. What a cute idea with the crochet backing on the pin cushion. Like you pincushion. Amanda Jean's fabrics are wonderful. The crochet pin cushion back is a great idea, I would never thought of that. Thanks for the giveaway chance. I love how you placed the striped fabric! This is super cute pin cushion! Thanks for the chance to win some great fabric! Cute fabric collection!! I'm really enjoying this bog hop, there are some great ideas for pincushions. Love all the pincushions! My Good Neighbors has been shipped. Can't wait and would love to win some, too. HI,I like your project>think I'll make one similar! Thanks for the giveaway too! i love seeing all these fun pincushions! great idea crochet and sewing ! Love your little pin cushion. Would Love to win. Love her new line. Thanks! What a cute idea, to crochet the backing. No matter how many people do the same thing--make a pin cushion, for example--there are still so many ways to make it one's own, and darling. Cute pincushion. Love the fabrics. Thanks for sharing the giveaway! You are definitely an over achiever on your pincushion. Paper piecing, crocheted bottom. I am impressed! Very creative. Thanks for sharing your very cute pincushion:). Wondered if you purposefully rounded the corners on your pin cushion since the paper piecing pattern is not rounded on the corners. I like the rounded corners. I like that you can do such tiny paper piecing! That tiny piecing blows me away! Such a sweet little pincushion! This is such a fun cheerful line- would be perfect to pull out in the middle of my rather long winter! You are inspiring me to make a pincushion. I've never made one before. I can't believe you got 28 pieces in a 3 inch square. Wonderful block. I like the idea of a crocheted back. Super cute! I'm so enjoying all the lovely pincushions on this hop. What a cute pincushion, the crochet base works really well. The pincushion you created is super cute! Hi Penny! Cute pincushion. I like the crocheted bottom. I've been having fun looking at all the pincushions each day. It's kind of like a shop hop. It's introducing me to new quilt bloggers. I'm a quilter & enjoy doing a lot of the same stuff you do. We got kayaks for Christmas & live in Austin so we've been enjoying the water sports this summer too. The paper pieced FW block is perfect. A whole FW quilt out of Good Neighbors prints would be brilliant. Great pincushion - love the crochet back, never would have thought of that! What a great change of pace to crochet the back :) And thanks for the tip about coloring in the paper piecing! 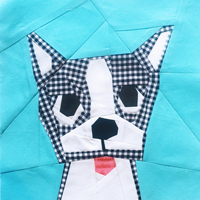 Maybe I'll get the courage to try paper piecing someday soon. Great idea using a crocheted back! Makes a very unique pincushion! Love Good Neighbors! Such pretty, bright colors! Love the pin cushion and also the fabric is phenomenal!! I would love to win a charm pack of Amanda Jean's fabric! I would mix so well with my scraps! Thank you for the giveaway! Another super cute pincushion! You guys are killing me with this blog hop! I am really enjoying seeing all the pincushions during this hop. There are so many variations and the Good Neighbors bundle is so adorable! The crocheted back to your pincushion is a nice touch! Beautiful. Love your pincushion. Thanks for the chance.